If you’re just getting into fingerpicking, you have probably noticed that your regular acoustic guitar doesn’t completely suit that playing style. It doesn’t resonate as much as you would like, the strings and frets are too narrow and you just feel like you can do much better. Choosing an acoustic guitar that can complement your style of playing would make it much easier to play your favorite tunes. However, fingerstyle guitars have a slightly different anatomy and operate by slightly different rules, so it can be hard to make an informed decision if you’re new to fingerpicking and you don’t know what you’re looking for. 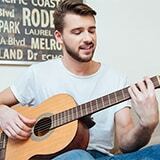 That is why I created this list of the best fingerstyle guitars to benefit your playing style. Any of these guitars will make your tunes sound loud and clear without you trying to break your fingers to get the sound you want. 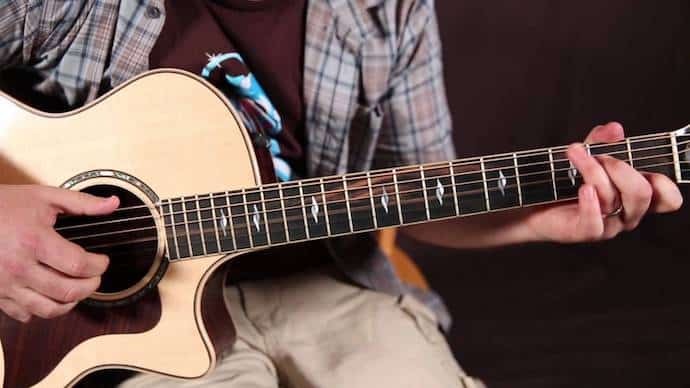 Here are 7 acoustic guitars perfectly suited for fingerpicking. One of the pioneers in the acoustic guitar industry, the Japanese company Takamine was one of the first manufacturers to perfect the concept of acoustic-electric guitars and their preamp-equalizers are still considered an industry standard. Their GD20-NS seems to honor their long tradition with a high quality warm sound that has been the staple of Takamine guitars for years. A couple of sweet features really set this guitar apart from all the other entries on the list. 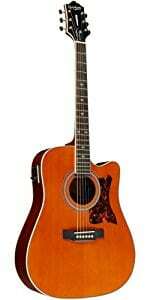 It has the Takamine trademark split-saddle bridge that provides accurate acoustic intonation. The bridge itself is pin-less, which means that the sound waves can move across the interior without losing their energy because there are no holes at the top. This makes your quest to get the perfect tone while using only your fingers even easier. If you’re looking for a guitar that performs as close to a high-end product without breaking the bank, the Takamine GD20-NS is a perfect choice. When it comes to acoustic guitars, there aren’t many companies that have mastered the making of this instrument as well as Taylor. Many famous guitarists, like Don Felder of The Eagles, have a special place for Taylor guitars among their touring gear. Their BBT (Big Baby Taylor) has a warm, crisp sound that does justice to the whole range of frequencies - deep, muddy lows and clear, bright highs. What makes this guitar great for fingerpicking is its size and shape - it has a smaller body and it’s lighter than a traditional dreadnought, while losing none of the tonal qualities and resonance. It packs a powerful sound with a broad dynamic range due to the Sitka spruce top that balances elasticity and stiffness perfectly. Its neck is very convenient and easy to play, while the body’s resonance perfectly captures percussion produced by fingerstyle playing. The Big Baby is a small guitar that outplays many big ones with its sheer tonal quality and brightness. The best thing about it - it’s considered an affordable Taylor option, so it’s not as pricey as some of their other instruments. If you want to go even smaller, Taylor also makes a Baby model, but that one may sound a bit too bleak and doesn’t pack a strong punch. Climbing up the price range, we have reached the Epiphone DR-500MCE - a stunning guitar with beautiful finish and a great shape. When you take one look at the DR-500MCE, it’s clear that the manufacturer had fingerpicking players in mind when creating this model - the frets are very wide and string spacing becomes increasingly wider towards the bridge. This gives a lot of space for your fingers, making this guitar a great choice for fingerstyle players. The nickel tuners at the top assure you that the guitar will stay in tune for a long time, while the classic combination of mahogany and sitka spruce provides a great resonating sound. The DR-500MCE also features a Shadow E-Sonic 2 preamp and great sounding pickups that allow you to plug it straight into an amp and play live. The cutaway body lets you reach those highest notes with ease, while also contributing to the sleek look of the guitar. If you’re ready to invest some money in a high quality product, the Epiphone DR-500MCE is definitely worth considering. Another well-known name in the guitar industry brings us a very affordable instrument that doesn’t disappoint with its performance. 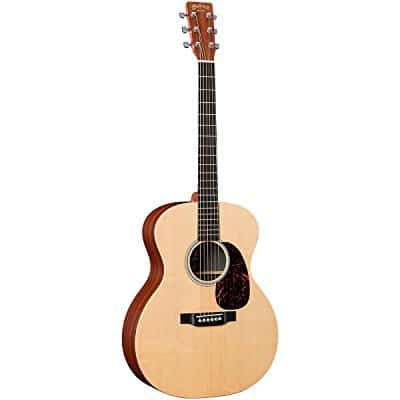 Although their electric guitars have an “untouchable” status, Fender’s acoustic guitars are available in the mid-range of the price spectrum, while still giving you the quality of a world-famous brand. Their CD-60SCE sports a laminated mahogany finish whose depth provides a lot of resonance, making it perfect for fingerpicking. You can choose between black, sunburst, and natural finishes (sunburst is a personal favorite of mine). It has a cutaway body for easy access to the upper register, as well as a comfortable, easy-to-play neck. The best thing about this guitar is that it features an onboard Fishman pickup/preamp that allows you to perform live on a professional level. If you’re just getting into fingerpicking and you’re not ready to invest in a high-end instrument, the Fender CD-60SCE is a great choice. It gives you solid sound performance, an onboard pickup, and the reliable Fender name. The L-Series LL6 falls straight in the middle of Yamaha’s lineup - more advanced than some of their beginner options but not as expensive as their high-end professional instruments. That being said, the LL6 delivers great performance and is definitely worth looking into, especially if you’re ready to make a step-up from your beginner guitar. It’s a classical guitar with solid rosewood in the back and sides, but it’s also very light and easy to play. At the top we have the Canadian Engelmann spruce that blends perfectly with the rosewood and partners with it to create a powerful, resonant sound. The unusually large bridge contributes to the guitar’s tonal qualities. Handcrafted with chamfered edges, it transfers the vibration of the strings to the body perfectly, creating a bright, balanced tone. Combine all of this with a sturdy reinforced neck that can withstand years of extensive playing and you get a reliable, great sounding guitar for a reasonable budget. If you’re looking for a truly high-end product, chances are you’ve been waiting for a Martin guitar to show up on this list. And I don’t blame you - if you have been into guitars for some time, you are probably familiar with the Martin name and its importance in the history of steel-string flat-top acoustic guitars. However, the X Series GPX1AE won’t completely deplete your budget and it’s perfect if you are a fingerpicking enthusiast. Like most modern high-end guitars, it features a Sitka spruce top which provides a chunky, sharp sound even when fingerpicking. If you like to add some percussion to your fingerpicking, you’ll be happy to hear that the combination of wood in the GPX1AE resonates very well and helps you achieve that percussive effect you’re looking for. To top it all off, this guitar features the solid Fishman Sonitone with volume and tone controls as well as a handy USB output. If you’re a professional musician who is interested in quality and performance over cost, the second entry from Takamine on this list might be the right choice for you. It’s so packed with features that I can barely do it justice in a couple of sentences, but it’s also the only guitar on this list whose price steps over the three-figure line. Starting with the tonewood, you already get a strong sense of quality - it features a sweet cedar top with an elegant satin finish, the neck is made from mahogany, and the fretboard from rosewood. All of these materials contribute to its warm, bright sound that responds great to fingerpicking. They also make the guitar very playable and its neck extremely comfortable - it fits in your hand perfectly and allows for quick movement up and down the fretboard. Probably the best thing about this guitar is the preamp system that performs faultlessly, which is so hard to find in an acoustic guitar. Tone and volume controls are supreme, the built-in tuner on point, and the sound quality natural. If you’re ready to splash on a high-end product, you will have to try very hard to find a better fingerstyle acoustic guitar than the P3MC. When buying a guitar that’s going to best suit your fingerpicking playing style, you need to take a couple of things into consideration. The most important thing is its resonance – as it’s easy to produce a full, ringing sound with a guitar pick but quite hard to do the same using only your fingers. You need a guitar that’s going to make the most out of every vibration and lets you produce quality sound effortlessly. Another thing to consider is the string material. Many fingerstyle guitar players like to have nylon strings in their guitar - they are much easier on the fingers and require less pressure and effort to create a melody. However, if you like the ringing and resonance of a classic Western-style guitar, you’re better off with steel or bronze strings. I hope this list helps you in your quest for the best guitar for fingerpicking. Try them all out and make sure that they are easy to play, while giving you a full, clear sound that will complement your personal playing style. Excellent post. Thank you, has been helpful. Great read, would love to try a couple of these. I would suggest the author try a maton fingerstyle guitar, an SRS808 or EBG808 model. These are higher end acoustic/electrics and very hard to beat. Tommy Emmanuel has a signature model of the EBG808 as well. Thanks for your suggestion, Darren. I’d definitely love to try them out if I ever manage to get my hands on one.